Alfred Hitchcock was right about the evils of birds, and now at least one flying raptor has decided to arm itself. 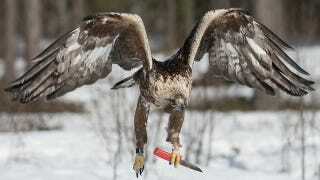 This golden eagle stole a knife from a nature photographer, and nearly made off with its newfound weapon. Dutch photographer Han Bouwmeester was in Västerbotten, Sweden, hoping to grab some unique photos of the local birds of prey, and cut up some meat to attract the predators. Attract them he did, but instead of gobbling up the meat, a golden eagle swooped down and picked up the knife Bouwmeester and his colleagues had just used. Fortunately, the knife-wielding eagle was a short-lived phenomenon, as the bird clumsily dropped his weapon back in the snow. This time, we were lucky. But who knows what will happen the next time a bird gets its talons on a blade? Photo by Han Bouwmeester via Daily Mail.